Figure 1. 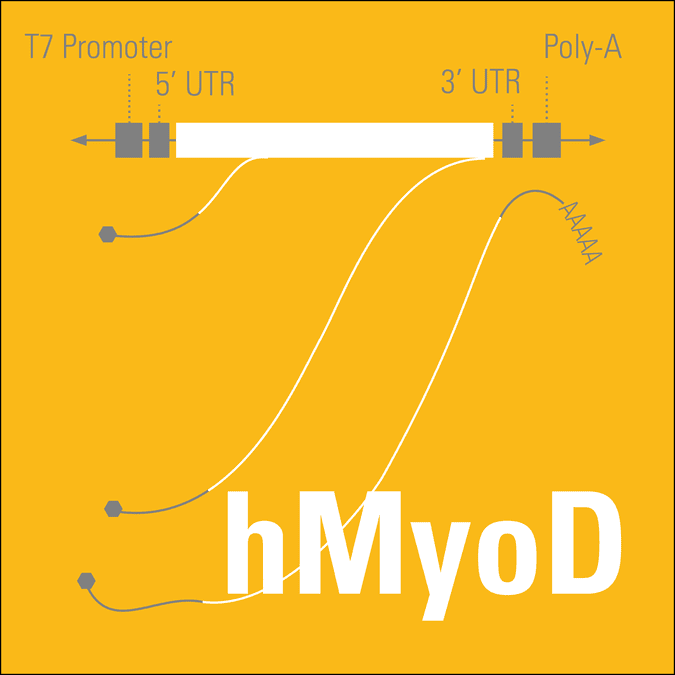 The mRNAExpress hMyoD transcript drives transdifferentiation into myocytes. Human foreskin fibroblasts were transfected with 1 µg of the mRNAExpress hMyoD Transcript per 24-well plate three times on three consecutive days (transfection was enhanced with RNAfection Transfection Reagent (Cat.# MR750A-1)). After an additional three days of transdifferentiation, the cells were immunostained for Desmin, a myogenic marker, to visualize myotube formation, and nuclei imaged with DAPI. The mRNAExpress hMyoD Transcript successfully transdifferentiated fibroblasts into myocytes.